When configuring your wheelchair, it’s important to consider, what wheels you need. The choice you make will depend on your primary use, be it indoor or outdoor, plus the terrain and the activity involved. And making the right choice can be crucial. Someone with a pain condition really doesn’t need a lot of vibration, and other users may value speed as part of their sense of independence. 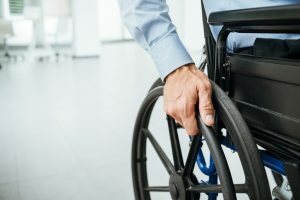 Here’s the information you need to choose wisely: The smoothness of the ride, speed, maneuverability, and control are all related to the wheelchair wheels, tires and casters. Choosing these components is not a straightforward task. So it’s wise to get an expert, such a therapist or healthcare professional to help you select the combination that meets your lifestyle, performance, maintenance and affordability needs. And a pair in the back (called drive wheels). Wheelchair wheels are made up of a tire, rim (and hand rim on manual chairs), spokes (or mags), and a hub. The hub is the centre of the wheel, the spokes (or mags) connect the rim to the hub and the rim is where the tire is mounted. Hand rims are used for pushing the wheelchair. Spoke wheels look like bicycle wheels and are made of metal. They usually have more than thirty spokes. Mag wheels are made of synthetic materials and usually have less than ten spokes. Important factors to consider when selecting the appropriate type of wheels for you is their weight, and the environment you will be using them in. Spoke wheels are usually lighter than mag wheels but they require more maintenance. They are less suitable for moist surfaces. Mag wheels are almost maintenance free but they may be affected by extreme temperatures. A standard power wheelchair drive wheel size is 18” (~45,7cm). Caster wheels start from 3” (~7,6cm). The wheel size affects comfort and required effort to move the wheelchair. Therefore you should select a drive wheel that will allow you to sit comfortably in the chair and at the same time requires a minimum amount of effort to propel it. Electric wheelchair wheels are smaller and made of a harder material. You can learn more about Invacare electric wheelchairs in this page. Truing (aligning) a wheel is required when a wheel wobbles when spinning on its axis. Mag wheels are trued upon fabrication and remain true unless they are exposed to extreme conditions. Spoke wheels are more vulnerable because various conditions get the spokes distorted. Such problems have to be repaired by a qualified wheel-repair technician. Flat free tires are pneumatic tires that are filled with a semi-solid material. They are not subject to flat tires and give a softer ride than a solid tire. There are pros and cons to each type of wheelchair wheel. An average user will probably not notice these differences, but a very active user will. You may need to consider having more than one type depending on the use. Wheelchair sizes will also be an important factor in the choice. You may find this resource helpful. Or you may find that you need high performance wheels which are not meant for the average wheelchair user. The sky’s your limit, and the cost of course!